Womens Strength Training: 7 Essential Pieces of Advice! These facts are some of the main differences you should take into account for women’s training. Remember them and you'll make faster progress and show up those guys in the gym! 1. Women can list a much greater percentage of their 1 rep max in multiple reps.
Women can lift reps closer to their 1 rep max and continue doing eccentric contractions (negative reps) long after men would not be able to continue. So, women should exploit this and work close to their 1 rep max, do negative reps, and exploit their improved endurance. 2. Most women are Iron and Calcium deficient. Many women in the United States are calcium and iron deficient and therefore should take a supplement to help with their strength training. This is one of those little things that can make a big difference for womens strength training. 3. Women have a lower level of neuromuscular efficiency than men. This means that women cannot recruit muscle fibers into one contraction as efficiently as a similarly weighted and trained man. This is one of the reasons that similarly build men are stronger than women. 4. Single, explosive movements are poor measures of functional strength for women. Since women have a lower level of neuromuscular efficiency than men, explosive movements are poor measures of muscular strength in women. Thus, between a similarly weighted and trained man and women (their squat weight and all other variables being equal) the man will have the higher the vertical jump. However, if they continue to do vertical jumps, since the woman has more endurance the man’s jumps will become lower and lower while the woman’s will stay about the same. 5. Hormonal differences are the primary reason women don’t gain as large muscles as men. Men's increased testosterone production accounts for their ease gaining muscle mass. Maximize gains for womens strength training by using correct workout routines and periodization overcome this. 6. 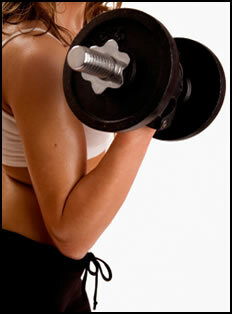 Women have the potential to work with extremely heavy weights and get really strong! Some people have put for the idea that women’s bodies are naturally weaker than men’s and therefore should not lift weights for risk of injury. This is stupid. Bad exercise technique and/or too much weight create injury. Women have the potential to get DARN STRONG and should not expect anything less. 7. Testosterone levels peak 12 days before ovulation. This is one bit of info that can give women an edge in lifting. You can schedule a really heavy lifting session on this day, when you know your testosterone is peaking. This will allow you to recover much faster from that session and use your time better. Every little bit helps. Some of this info is just interesting, while other pieces can be used to make a true difference in your training. Realize what you can change, know what you can’t, and work like a demon to take advantage of everything. • Click HERE to leave '7 Facts For Exceptional Womens Strength Training' and get more info about womens strength training! • Click HERE to go back to the Complete Strength Training Homepage and get more info about strength training! Rippetoe, Mark, and Lon Kilgore. 2007. Starting Strength: Basic Barbell Training. Wichita Falls, TX: Aasgaard Co.